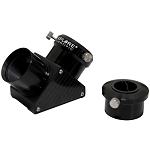 The 2" diameter barrel 100°-Series 25mm Eyepiece from Explore Scientific is an ultra-wide field telescope eyepiece designed for planetary and deep-space observations. 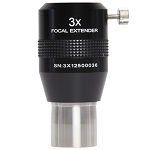 Its wide exit pupil makes this eyepiece ideal for comfortable viewing for extended periods. 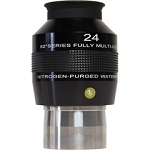 The contrast is enhanced by a fold-down rubber eyecup that prevents stray light from leaking into your eye. 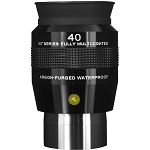 Anti-reflective multicoated optics ensures bright, high-contrast images with true color transmission across the entire wide field of view. 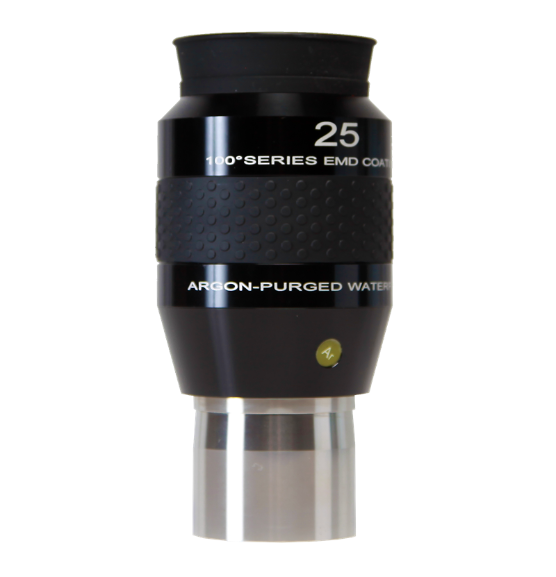 The eyepiece features a textured surface for a sure-grip when changing it out, argon-filled body for water and fogproof performance when used in extreme temperatures and climates, and a double-tapered barrel for smooth insertion and removal from the focuser. 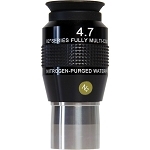 Box Dimensions (LxWxH) 7.3 x 6.5 x 6.1"